The Green Bay Packers will host the Bills this Sunday at Lambeau field at 6pm GMT time. All eyes will be on Mike McCarthy’s men to see if they can bounce back from last week’s defeat to the Washington Redskins against a resurgent Buffalo Bills. Aaron Rodger’s side are still smarting from last week’s loss to the Redskins, and with their previous game ending in a draw against the Vikings, they now rest on a questionable record of 1-1-1. They still possess valuable attacking outlets in their wide receivers Devante Adams and Randall Cobbs. The pair are set to start on Sunday and odds suggest they will be Rodger’s main target on the offence. As the first bet in our Packers vs Bills predictions, we’re tipping McCarthy’s men to emerge as narrow victors on home turf. They will have a hard task in securing a win against the Bills. Brandon Beane’s men are on a high after last weeks shock upset over the Vikings. Josh Allen and co walloped the Minesota men, with a final score of 27-6; their greatest win against the Vikings since 1995. Their running game was especially impressive last week, with a particular focus on LeSean McCoy who is set to feature at Lambeau field. So, whilst we’ve made Aaron Rodgers side our pick to win as part of the Packers vs Bills predictions, we’re betting that it’ll be a difficult game for McCarthy’s side. Rodgers will be key for the Packers, and with him leading the offence, we’ve tipped them to pull through against the Bills. Green Bay are projected to win, trading at 1/4, whilst the Bills are wagering in at 31/10. Yet, they’ve haven’t been given great odds of keeping the Bills offence quiet. They are picked to keep the total number of points under 45 with the betting at 10/11. After last week’s performance, punting on Rodgers and co to let the Bills in behind would probably be the best of our Packers vs Bills predictions to bet on. Whilst we have tipped the Packers to concede plenty of touchdowns, it would be foolish to think that they wouldn’t be capable of performing heroics at Lambeau field. The last installation of our Packers vs Bills predictions takes a look at this by suggesting that they’ll win by a narrow margin of 1-6 points. 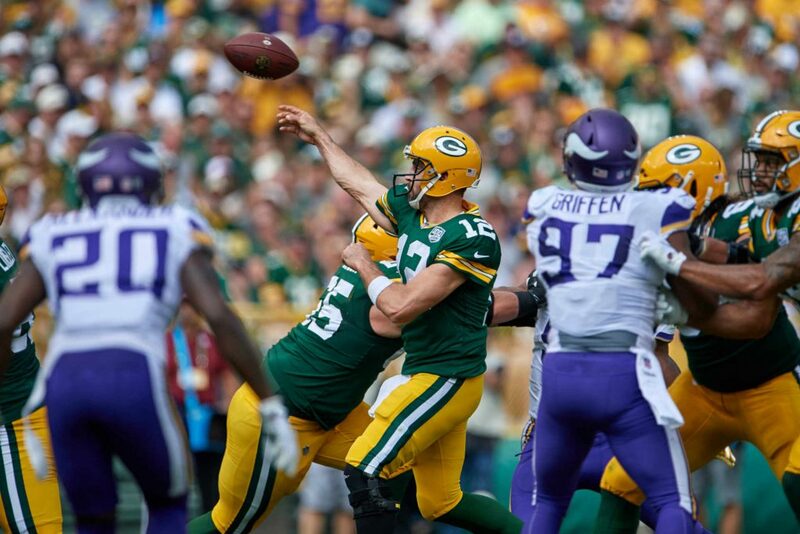 We’ve already witnessed Rodgers do this against the Bears in their first game, where they came back from 23-0, to win 24-23 in the last quarter, thanks to some unplayable throwing from the 34-year-old. Odds of 10/13 might seem like a risky tip to bet on, but consider this: Aaron Rodgers, playing at Lambeau, in front of his fellow cheeseheads in what could potentially turn out to be a big game. The stage is set for our future hall-of-fame quarterback to lead his men to a win against tough opponents. Click here to read our NFC North winner predictions guide, with all the information on how the Packers fare on emerging as victors of the group.